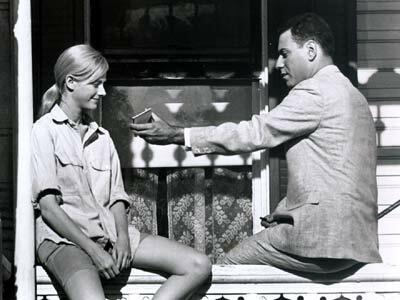 I just got done watching "The Heart Is A Lonely Hunter," a movie made back in 1968, starring Alan Arkin and Sondra Locke; if I recall, neither of them ever got the super-stardom they merited. Stardom yes, but not super-stardom. It boasted some other near-super-stars such as Cecily Tyson, Percy Rodriguez, Stacy Keach. But my favorite over all was Laurinda Barrett, the mother of the family, the wife of the crippled guy. I found her most interesting--of all the characters because she so typically exemplified the mother-housewife of the 1960s, at least in Middle America. Not only her mannerisms and style, but she even looked like the mothers of many of my childhood playmates and classmates (not my own mother, though; I was a late child, and she already had grey hair by time I came along). These noble, gallant women of yesteryear, their numbers now almost extinct, who cared and cherished more than they themselves were treasured. It's a very powerful movie, and I found myself not breathing for extended periods while watching it, it was that good. ".....I thought that movie was depressing....."
3. ".....I thought that movie was depressing....."
No movie--or book, for that matter--concerning the deaf is un-depressing. There's always a sad, or bad, ending. That's just the way the world is, and one can't do a damned thing about it. But rather than thinking of it as depressing, think of it more as uplifting, inspiring, that we accept, adapt, and move on with defiant confidence and good cheer, knowing that in the end, God heals all. I ever saw was "Black Robe" back in the early 90s.